This recipe was developed and taste-tested during one of our twice monthly Kitchen Hours at the Yum Project Kitchen. Cooking instructor, Wendy Cannon, noticed that there was no recipe for blueberry muffins on our website. Her favorite ones can be found at Agora Coffee Shop in downtown Fredericksburg created by an amazing baker and friend of the project, Andi Stone! 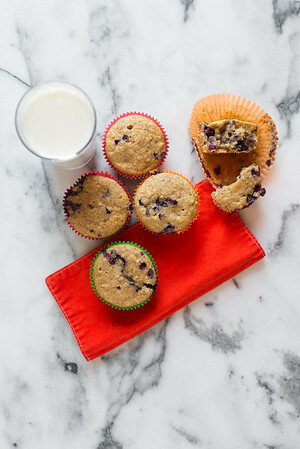 This is our version of a healthy muffin and it got great reviews by our tasters in the kitchen. Preheat oven to 350 degrees. Mix dry ingredients together in a large mixing bowl. In a smaller mixing bowl, mash banana with a fork. Add honey, almond (or other milk), coconut oil and stir together. Pour wet ingredients into dry and mix together until combined. Gently fold in blueberries. Fill standard muffin cups 3/4 full. Bake 17-20 minutes until toothpick inserted in the center comes out clean. Let muffins rest on cooling rack.